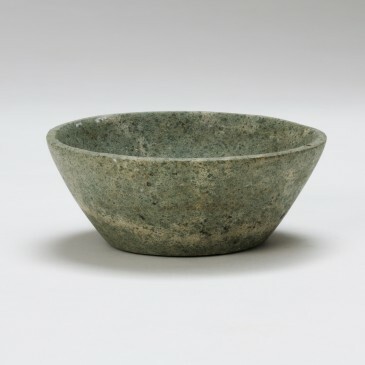 A conical bowl, with a perfectly flat circular bottom that provides a good balance to the vessel. 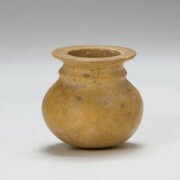 A conical bowl, with a perfectly flat circular bottom that provides a good balance to the vessel. Flat and angular lip. The mottled stone, covered with small darker inclusions, gives the surface a unique and original decoration. 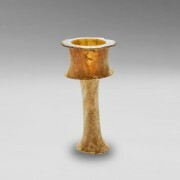 The vessel has an accurate, perfectly regular shape; it would have been shaped using a potter’s wheel, and hollowed out by drilling. 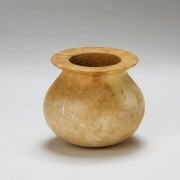 From the Neolithic period, when the nomadic populations started to settle, stone vessels quickly became prominent in Near Eastern economies: they can indeed be found everywhere, in Egypt or in the Near East, in various shapes, dimensions and stones, and of many uses. Complete vessel, although reassembled; small repairs; chips on the lip.